Playing with the dreidel (a spinning top with four sides, and a Hebrew letter printed on each side) is a traditional Hanukkah game played in Jewish homes all over the world. 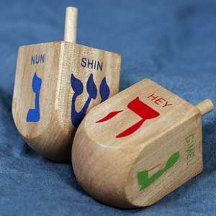 Although this popular tune is often referred to as a Jewish folk song, its author was actually Samuel E. Goldfarb, “the father of Jewish music in America”, who gave it the title “My Dreidel”. Born in 1891, Goldfarb was a prolific composer of songs and other music. Together with his older brother, Rabbi Israel Goldfarb, he composed hundreds of songs which are still sung in Jewish schools today.